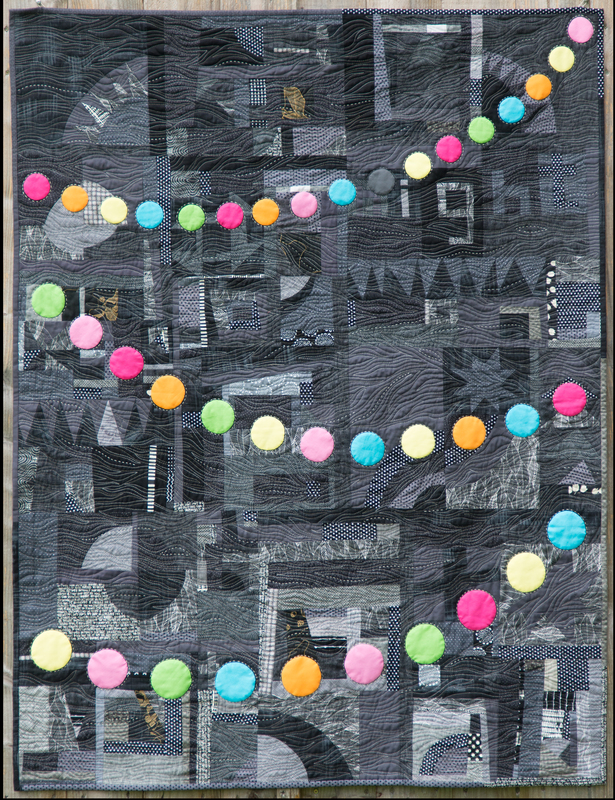 I’m always inspired by Jo Avery’s quilts. She creates colorful pieces full of detail. 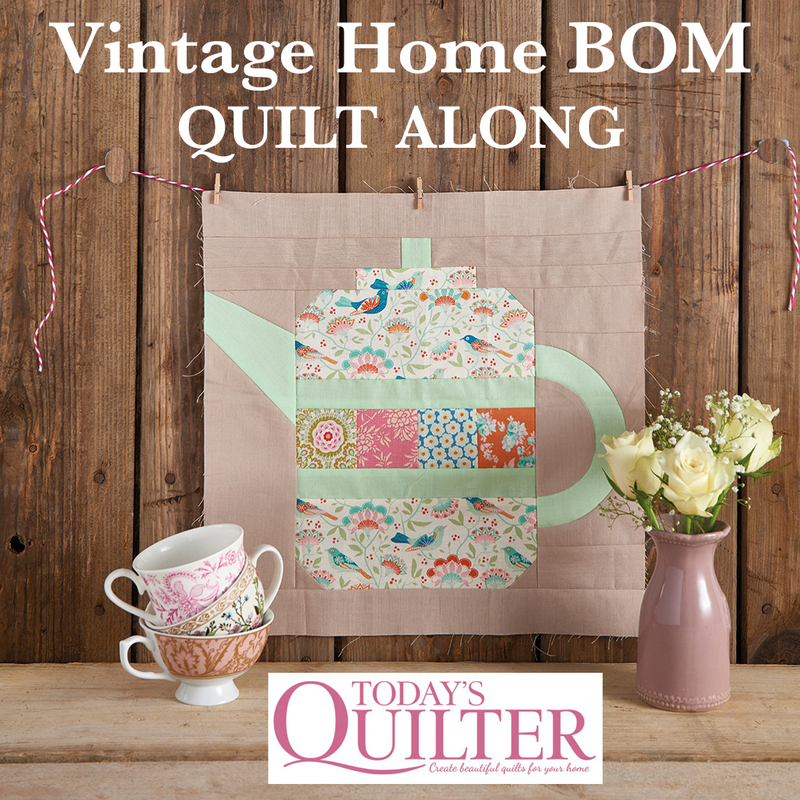 She may add hand embroidery to a machine done pieces, load up a quilt with spectacular blooms, or make a stunning modern quilt with the base of traditional blocks. And if you are in her area, you can visit her shop and take a class! Each month we select one random winner to receive a 12 spool BOX of Aurifil thread for just making the challenge block and sharing ut! Details at the end plus last month’s winner! Let’s get to know Jo! I live near a town called Linlithgow which is just outside Edinburgh in Scotland. Linlithgow is a really historic town with a palace that was the birthplace of Mary Queen of Scots. The area where we live is called Blackness with it’s own castle that looks out over the Firth of Forth. A lot of the Outlander series it shot around this area and Blackness Castle stands in for Fort William. The land in this area was divided into a large number of seven acre small holdings between the wars. Most of the inhabitants have sold their land to neighbouring farmers but we still have our seven acres which we have planted with thousands of trees. We moved here eight years ago and now some of our trees are really big. They are a mixture of native British hardwoods, oak, ash, hazel, cherry, alder, hawthorn and birch. People often ask us what we plan to do with the trees but we’ve just planted them to encourage wildlife and because we love trees. 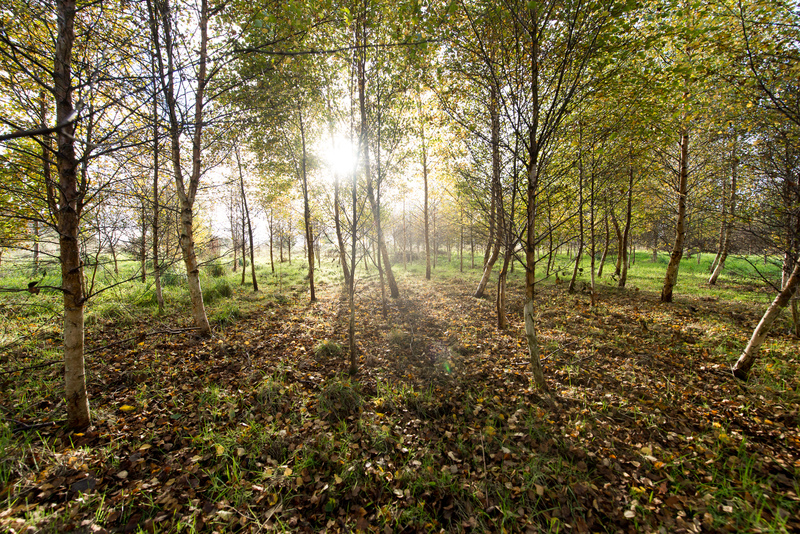 My favourite place is our birch wood which is now big enough to stand inside and be completely surrounded by trees. There is a particular spot between two bendy trunks where I like to stand and gaze at the leaves above and around me, or in the winter to stare at the snowy branches. We call our seven acres Shangri la Farm as it is our little piece of paradise. Every day we walk around and note all the minute changes of the seasons, and think ourselves extremely lucky. It wasn’t really a first quilt sighting but it was a first patchwork sighting. My sister, Jane, is quite a bit older than me and was pregnant with her first child when I was ten years old. 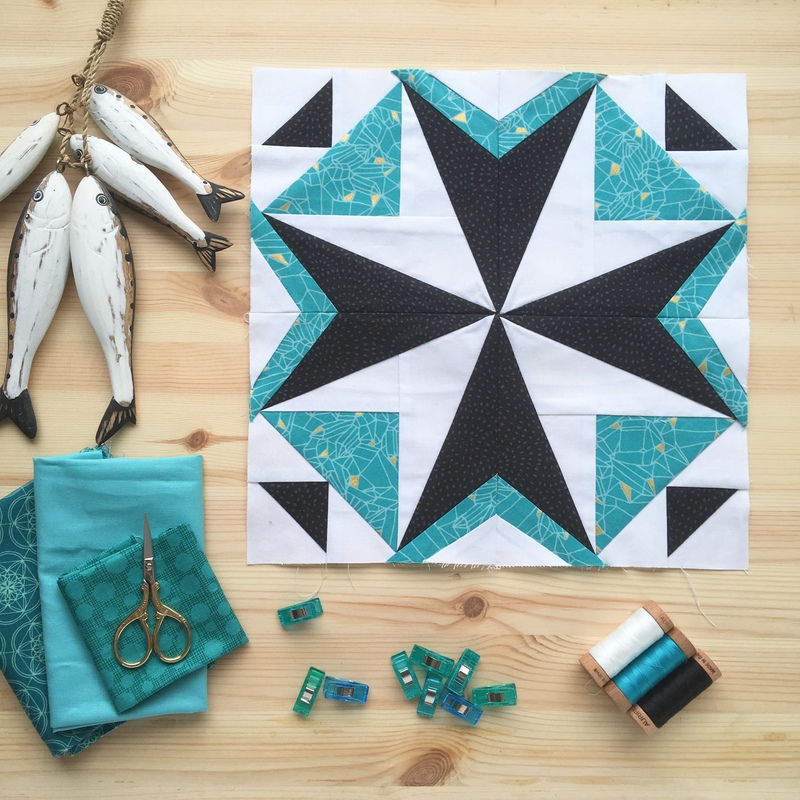 She started sewing hexagons together over paper to make a baby quilt, what we would now call EPP. Jane had taught me to sew when I was six and I had made my first soft toy, a squirrel, out of curtain remnants. My mother had also taught me to knit and I spent all of my childhood making things with fabric or yarn. When I say the patchwork hexagons I really wanted to try them too! Jane showed me how to baste and sew the hexies and I made them into a clutch bag for my mother. Years later when I started living with my husband I bought some templates and fabric from Liberty’s in London and started making my first quilt. 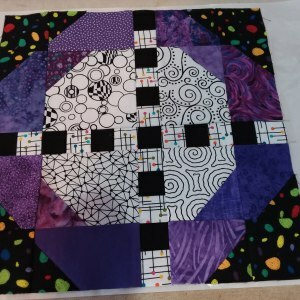 Once I had finished piecing all those hexagons together I didn’t know what to do next, so I went along to a local quilt group to find out how to quilt it. They were kind generous folk who not only shared their quilting wisdom but introduced me to rotary cutters and mats! I had no idea that these things existed and it blew my mind! I really thought the only way to make a quilt was endless basting over paper and hand sewing. Very soon I was strip piecing and machine quilting and I’ve never looked back. 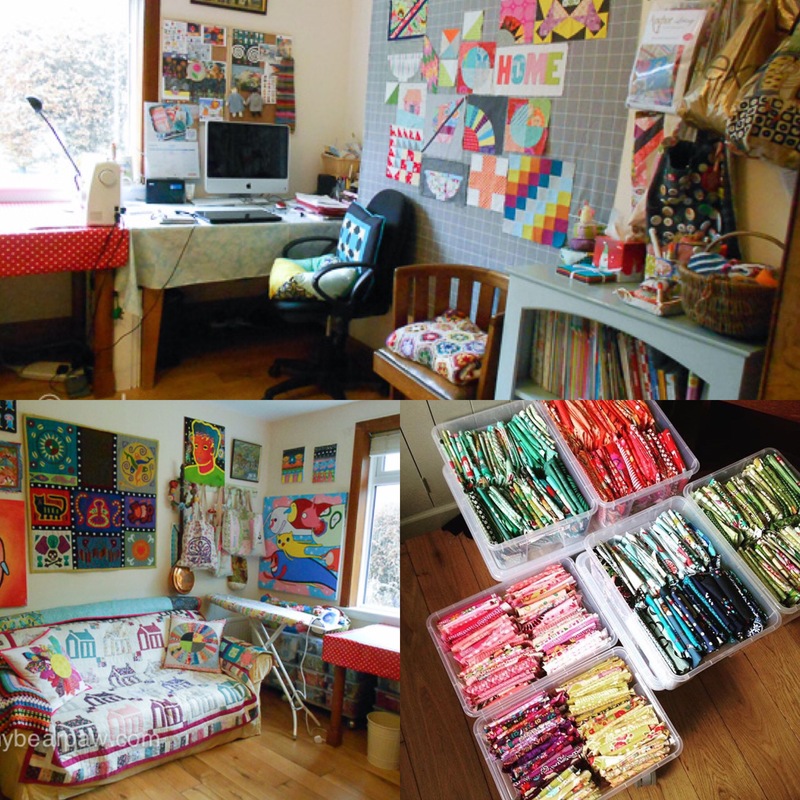 I have two studios – I teaching one at my shop, which is kept very tidy by my amazing ‘Girl Friday’ Jane, and a sewing room at home which is an absolute tip! I am not a naturally tidy person when it comes to my work space so I always try to employ really tidy people. Unfortunately I can’t usually persuade them to live with me too so my sewing room is usually way more out of control then these photos show! 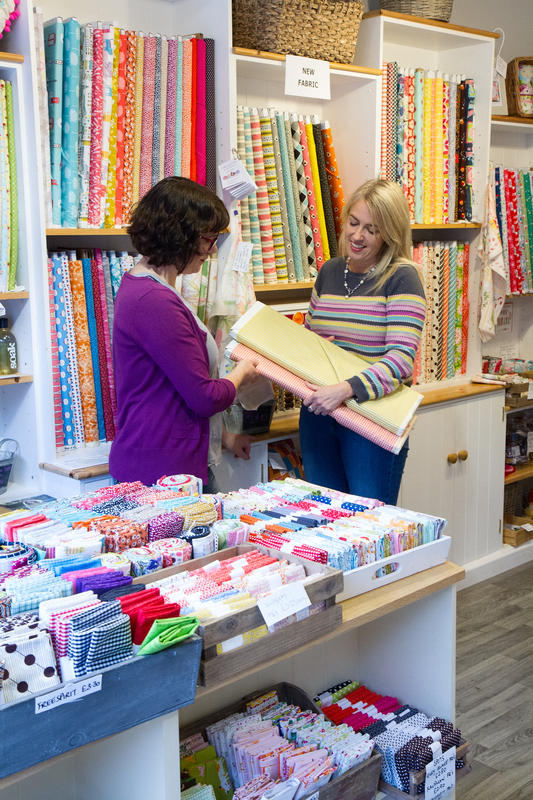 Our central Edinburgh venue has a small store at the front selling fabric, yarn and notions, and a large teaching studio at the back with room for 8-12 students. The site used to be a hairdressers and still has a mirrored wall at the back which makes it look twice as big as it really is! At home I have a room full of fabric with two large tables side by side, one full of ‘desk stuff’ and one for my cutting area (which sometimes you can see under all the fabric). I have a number of clear stacking boxes from Ikea on three wheeled trolleys (that my hubby made) where I store all my fabric. When I run out of space I buy more boxes and the stacks get taller and taller! 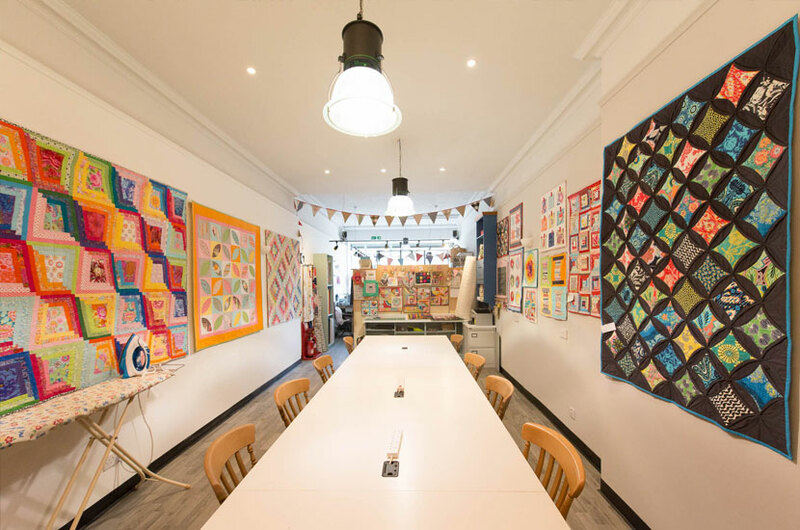 The room also has a sofa (which is usually covered by fabric, quilts and batting), a design wall and a space in the centre large enough to baste a quilt. My machine now sits on a specially made low table that butts against the cutting area. Except I just bought a new machine which doesn’t fit the table! My lovely hubby says he will sort this for me soon. 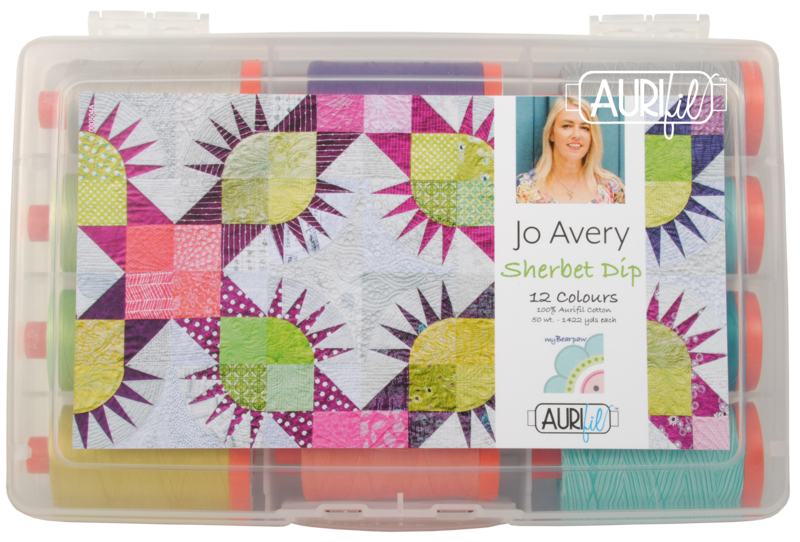 Probably the most exciting thing to happen to me in a long time was getting my very own Aurifil thread collection, Sherbert Dip, which was launched at the Festival of Quilts last August. 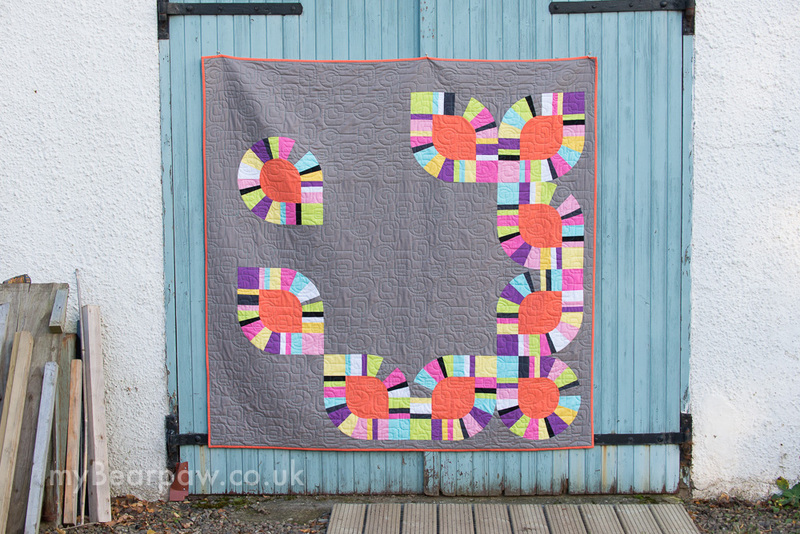 I make a lot of quilts for UK mags like Today’s Quilter and Love Patchwork and Quilting. But this year I have projects in some international publications too. My Quilt Invaders quilt is in the QuiltCon2018 magazine that was out last month and my Flower Bowl Applique Wall Hanging is in the latest issue of Simply Moderne. 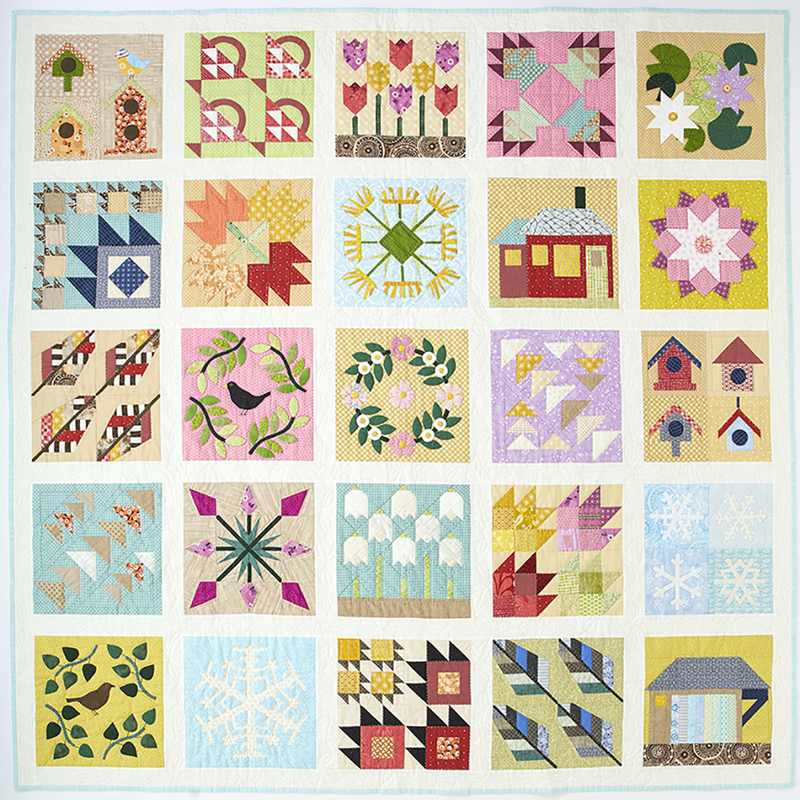 My Modern Love quilt was the Modern Quilt Guild Block of the Month in January and I am half way through my current Block of the Month ‘Vintage Home’ in Today’s Quilter. I like to crossover between modern and traditional projects as I really like all the quilt aesthetics and don’t like to limit myself to one genre. I also like to design embroidery patterns and I have more of these coming out soon! About your block – What location inspired your block? 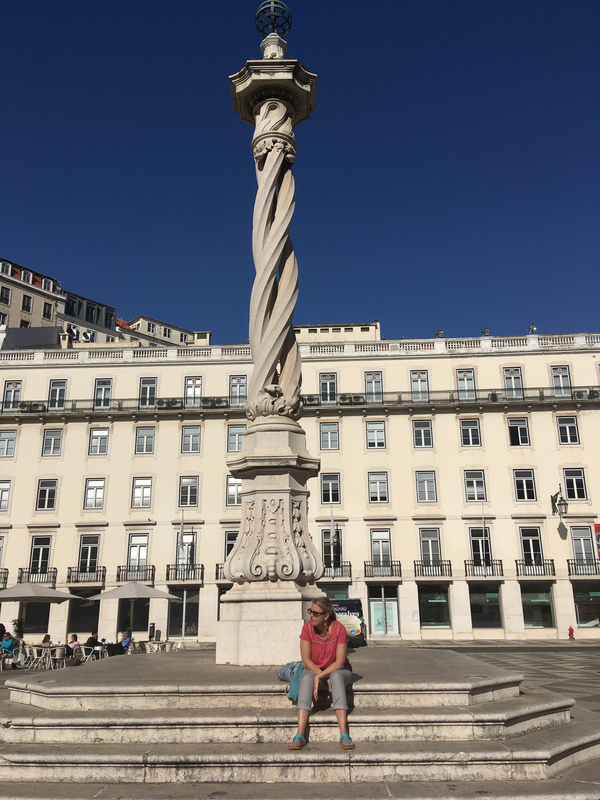 Last November we visited Lisbon the capital of Portugal for a few days to celebrate our wedding anniversary (28 years!). It’s a beautiful old city with an amazing climate and the best custard tarts known to humanity. I was expecting to find these things, but I wasn’t expecting the tiles. 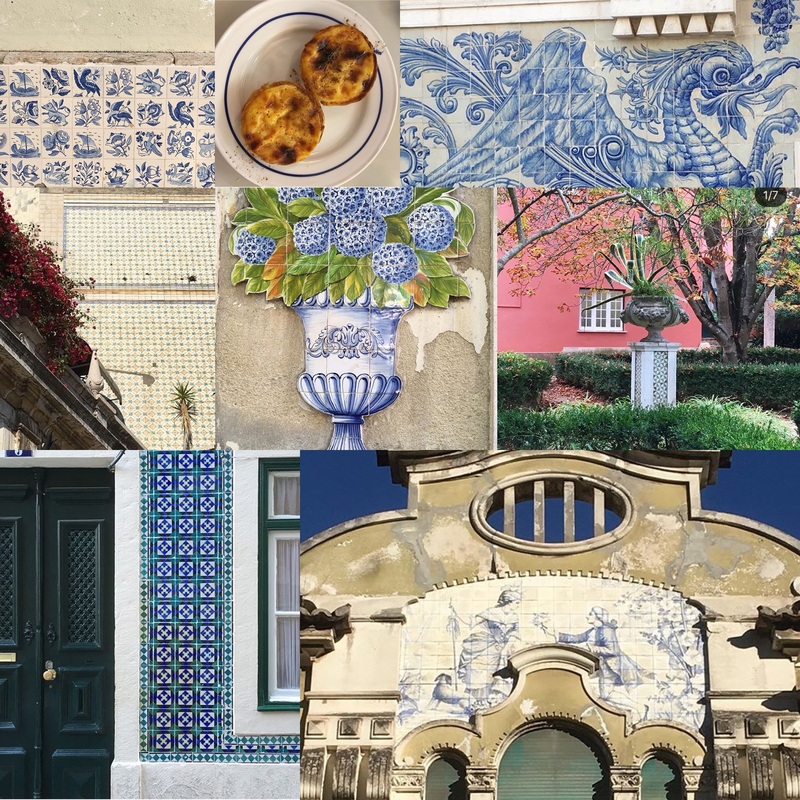 The majority of the buildings are covered by beautiful ceramic wall tiles. 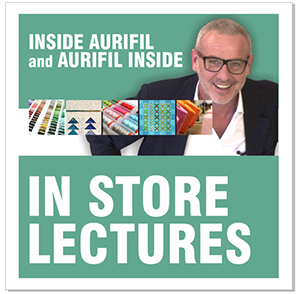 Which means everywhere you look there is a new quilt idea! 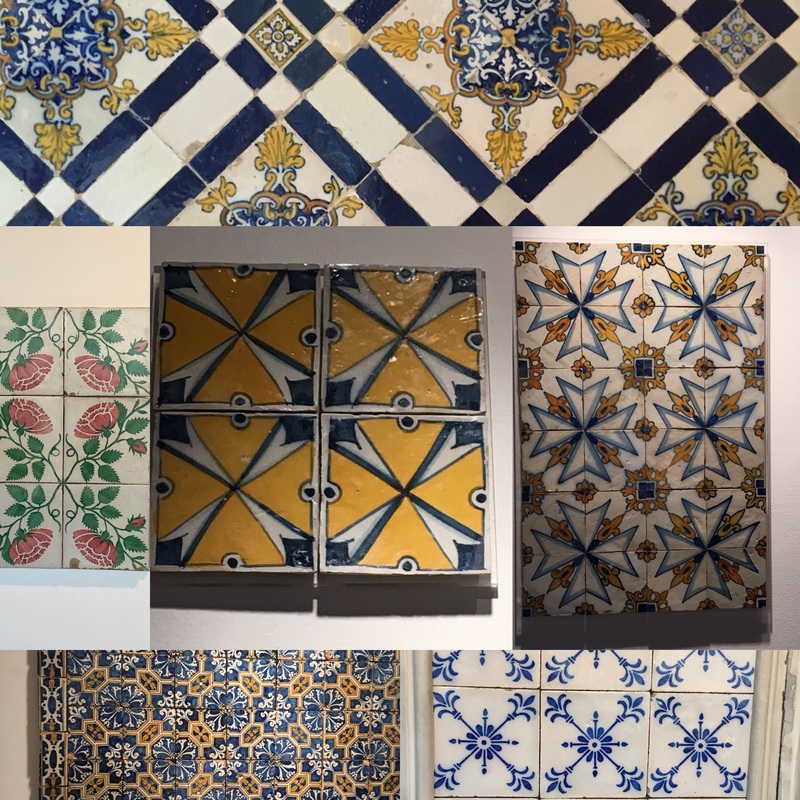 There was so much inspiration round every corner, I didn’t know where to look next, and that’s without the visit to the Tile Museum! So I have based my block on an interpretation of a few different tiles I saw on my trip. Of course when you ‘tile’ this block you get a whole new dimension to the design. What is your Favorite quote? ‘Worry is a misuse of your imagination’. I’m not naturally a worrier but as I’ve got older I have tended to get more anxious about things. I first saw this as a piece of grafitti and it really struck me – try to imagine good things happening rather than bad things and maybe you won’t worry so much! I also like the one on this embroidery I made! 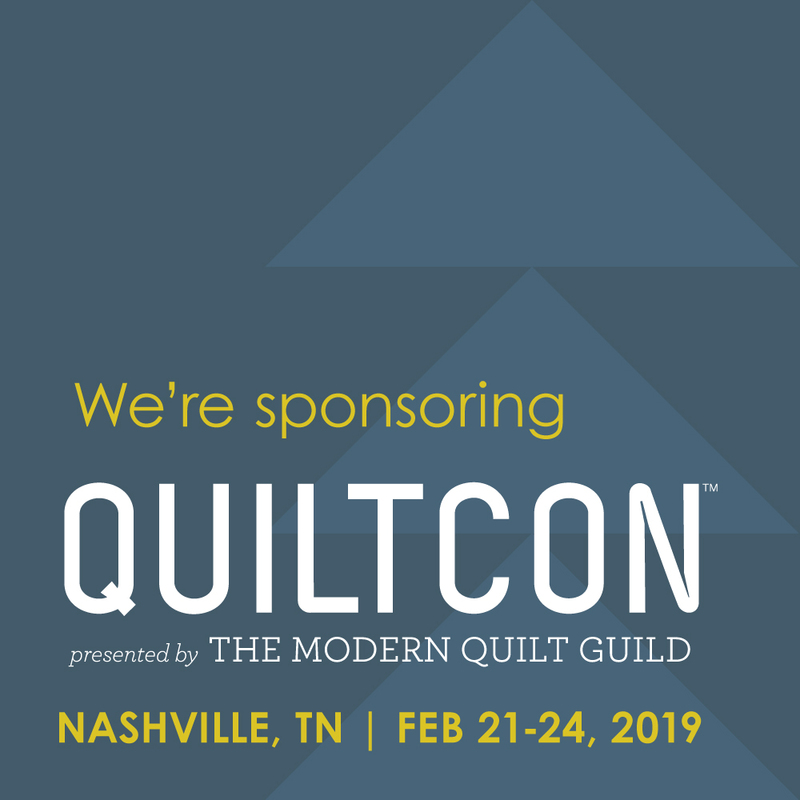 Learn about Jo’s project to help give quilts to all the beds in this community project to build tiny homes for those in need of housing. I have a little oopsie I am sharing PLUS a tip that helped me with paper piecing. And you might want to see all 3 of my blocks together.. I’m trying to decide where to use the swans again, I LOVE the swans! 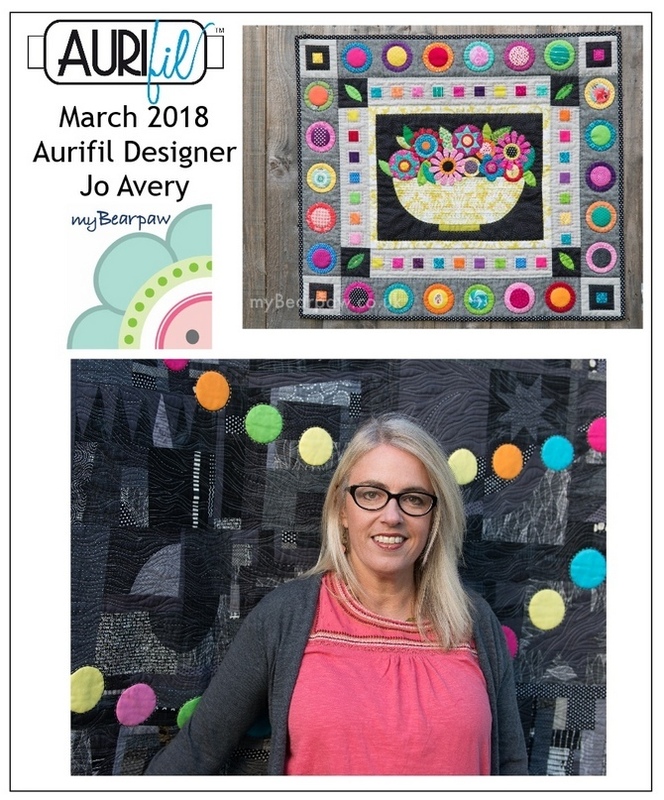 We have been able to find a way to enter your quilts here at Aurifil, it does go to a 2nd page, but at least it’s here now! Sure glad Our RANDOM picker had to select the winner this month, your Feb blocks were outstanding! 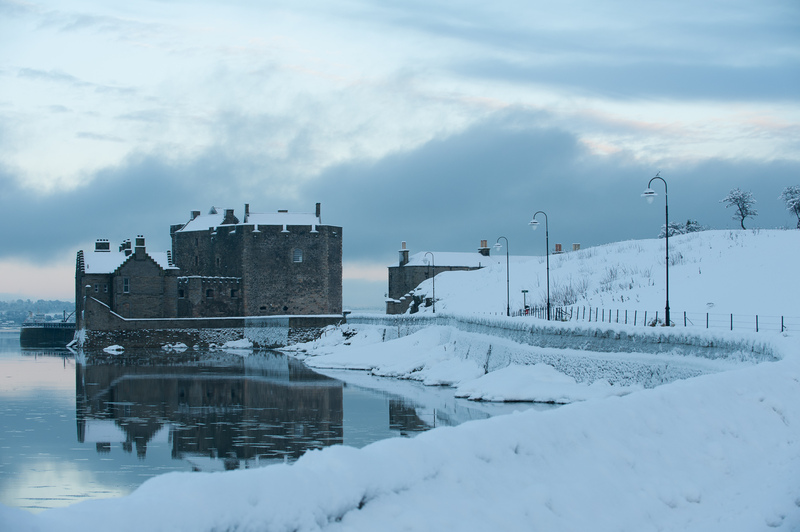 Wonderful post and photos – I loved the photo from her town in the snow! Beautiful quilts! Yes, a paper pieced block!!!! Great interview. I cannot wait to make this block. Love this block! and I also love the pillow that is shown just below the download link to the block. Is there a how-to anywhere on making the pillow? It’s just beautiful! Hi Kathleen, thank you! 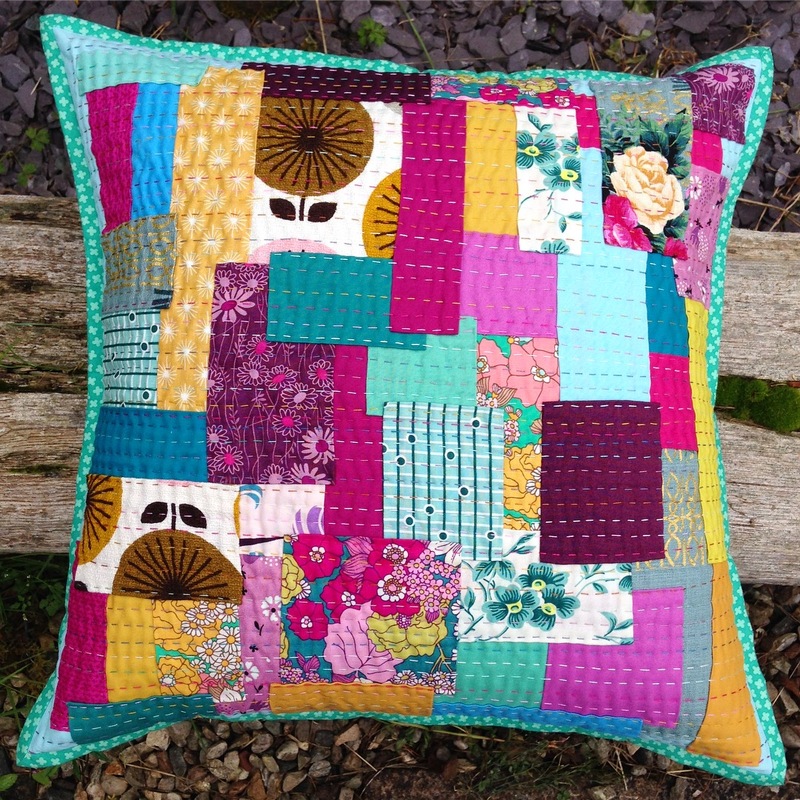 That pillow is a pattern from Today’s Quilter magazine issue 30. I am sure you can still buy a back issue as it is only a couple of months ago. Check out their website for details! Such beautiful photos… indoors and out! Can’t wait to try this block pattern!